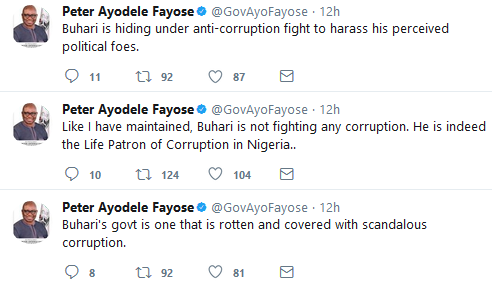 Governor Fayose is not happy with the APC Government. 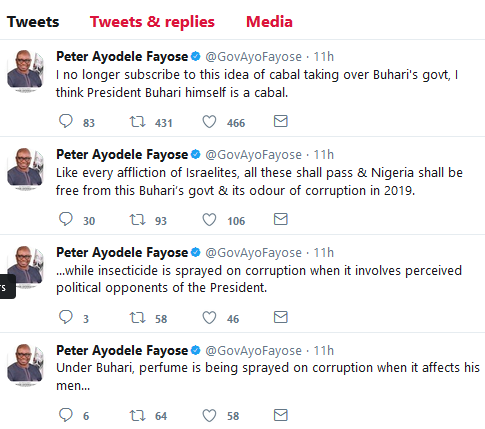 The Governor who is worried about the state of the country took to Twitter in the middle of the night to address some things he finds questionable. 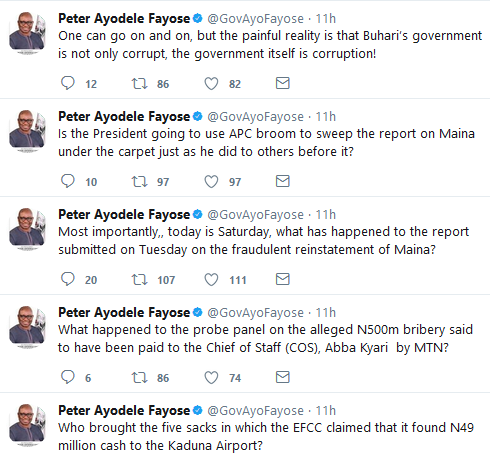 He asked if the APC led Government will use their brooms to sweep the report on Maina under the carpet, just like they do. He spoke about cabal in government, saying he thinks the President is the cabal himself. He further went on to ask who the owner of LEGICO Shopping Plaza, in Ahmadu Bello Way, VI, is, saying the EFCC found N448.8 million cash in there and the owner has not been named. Who brought the five sacks in which the EFCC claimed that it found N49 million cash to the Kaduna Airport? What happened to the probe panel on the alleged N500m bribery said to have been paid to the Chief of Staff (COS), Abba Kyari by MTN?, the Governor asked. 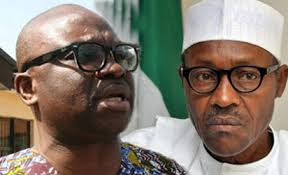 I ask our President, what has happened to the report on the $43m discovered in an apartment at Osbourne Towers, Ikoyi, Lagos?, he asked another one. The tweets are quite many.... remember we told you he didn't sleep? See all of them after the cut.